Our river guides work their Chacos off to make sure you have a fantastic adventure. With big hearts and big smiles, our lively river guides will keep you laughing through every twist and turn on the Snake River. Dave Hansen ensures the highest standards for our river guides. Every river guide completes a Dave Hansen Guide School which provides rigorous, hands-on river safety and river ecology training. Additionally, all our river guides continue their education through periodic classes with local environmental groups and naturalists throughout the year. Alex returns to Dave Hansen for his fifth season and brings along 14 seasons of guiding experience, making him one of our most excellent guides! In search of a year-round sandle burn, Alex often makes like a bird and migrates south for the winter; most recently venturing to Honduras to guide on the Cangrejal. Alex’s grand adventures in guiding have also led him down rivers in Maine, Costa Rica, and New Zealand. Hailing from North Yarmouth, Maine, Alex first moved out west to Denver to study international studies at the University of Denver. He enjoys kayaking, skiing, hanging out with friends, exploring new places, and eating at Yankee Doodle. If he’s not on the river, he is most likely on his way there. Alex encourages his guests to dress warm, have fun, and not stress! Hunter is one of our senior guides and joins Dave Hansen for his eighth season! From Beaumont, Texas, Hunter attended Ole Miss where he studied political science. Hunter is a volunteer Firefighter and EMT with Jackson Hole Fire EMS and just completed his first season as a ski patroller at Jackson Hole Mountain Resort. In his free time, Hunter likes to kayak, ski, have cheeseburger picnics, and listen to Widespread Panic or Grateful Dead. He’s kayaked down the Grand Canyon and even taken a 10 day trip down the Karnali River in Nepal. If he’s not on the river, you can find him at the Stage Coach Bar and Grill, ‘kicking it with the sons’, or maintaining his handlebar mustache. Hunter encourages his rafters to relax and enjoy the ride! This is Billy’s third season with Dave Hansen. He has ten years of guiding experience and is trained in First Aid, CPR, Wilderness First Responder and Swiftwater Rescue. Billy’s from West Bend, WI and studied foresty at the University of Wisconsin Stevens Point. Billy loves telling jokes and making people laugh! He encourages his rafters to ‘slow it down’ and enjoy themselves! Hayden is from Colorado and has been a raft guide for two years. This is his third season and he is excited to spend it here in Jackson! He has guided on several rivers in Washington and Colorado and will talk your ear off about the month he spent in the Grand Canyon. Hayden is CPR/First Aid certified and is also an Outdoor Emergency Care Technician. When he’s not rafting, he is out riding his bike, fly fishing, or just about anything else that keeps him outside. His motto when in the outdoors is to leave the place you visit better than when you arrived and to always be humble and grateful of the opportunity to enjoy it! Jess is joining Dave Hansen for her sixth season! She has five years of guiding experience and a Wildlife First Aid certification under her belt. Originally from Jackson, WY, Jess recently graduated from the University of Colorado where she studied nursing and played on the soccer team. If Jess isn’t on the river, you can find her on top of a mountain or on the soccer field. She loves hiking, camping, skiing, and eating at Local Restaurant and Bar. Jess’s number one rule for rafters: if everyone swims in the river, she will too. If you’re in her raft, get ready to swim! This is Josh’s first season with Dave Hansen! Josh is from Anchorage, Alaska, and grew up playing hockey and basketball. He studied welding and non-destructive testing at the University of Alaska Anchorage. Outside of sports, his hobbies include skiing, hunting, climbing, mountain biking, and hiking. Josh wants to encourage his rafters not to be afraid to ride the bull, jump in and swim, and ask questions! Not only is he the engineer of our famous Rafting Bears, but he is an excellent river guide! Jonathan loves to meet danger nose to nose, and isn’t afraid of what the River will throw at him next. You’ll love your time with Jonathan just as much as you’ll love your whitewater rafting adventure! Nolan is back for his third season. He is a true midwest transplant from Traverse City, MI and studied international affairs at the University of Colorado- Boulder. During school he had the opportunity to study abroad in Valparaiso, Chile. Following graduation, Nolan spent a year guiding in Colorado on the Roaring Fork and the Arkansas River. In addition to his years of guiding experience, Nolan is certified in CPR, First Aid, and Advanced Wilderness First Aid. When Nolan isn’t on the river, you can find him dreaming about ski lines, mountain biking, climbing, hiking, or completing a ski tour in the Tetons; even a compound tib/fib fracture couldn’t stop him! Nolan encourages his rafters to enjoy the time they have on the water because you never know when you will be out there again. McKenzie returns to Dave Hansen for year two; this will be her first year guiding! Lover of lobsters and all things ocean, McKenzie is originally from Maine! She studied environmental science at the University of Michigan and fell in love with Wyoming after working at a dude ranch in Saddlestring for many summers. Besides being on the river, McKenzie’s interests include traveling (ask her about her cherished time in South Africa), reading, mountain biking, and of course SKIING POW in the winter. She is also a lover of Thai massages, rooftop bars, and brunch with friends. McKenzie wants her rafters to enjoy the ride and not be afraid to jump in and get wet! Lewis is a city guy who has a liking for the great outdoors and other activities that he associates with true manhood. Although he is a city guy, we let him guide for us at Dave Hansen, and turns out, he does a great job! He can be a bit cocky, but don’t worry he is a great raft guide, especially with all of his outdoor experience and knowledge. If Lewis is your guide, he will protect you and guide you down the river safely! Have no fear! Grace is excited to be back with DH for her second year, and first year as a guide! Not to be confused with the City, Grace is from UPSTATE New York, where her favorite things include apple picking in the fall and family trips to the Adirondacks. Grace played lacrosse at Syracuse University and is also the only girl in the middle of four brothers, so she is tough enough to take on just about anything! From fishing to rafting, Grace is a river girl and would love to talk to you about the best of times she’s had on the Snake. Her other loves include Thai food, strawberry rhubarb pie, and the Talking Heads. If you have kids on your trip, be careful, because Grace loves children and has been known to try to sneak them into her dry bag when parents aren’t looking. If she’s not on the river, you can find her painting in Grand Teton National Park, jumping on her trampoline, or hanging with friends. Legend has it that baby Miri was first discovered by Dave Hansen in a manger floating down the Snake River. Using only her tiny infant arms as oars, baby Miri deftly navigated Hell’s Canyon and Dave watched her float to shore and portage her manger inland to set up camp for the night. He then immediately hired her and she became the youngest river guide on record. While most of this is based off legend, Miri’s connection to the river is deep and she was most likely a pirate in another lifetime. Miri is the daughter of the legendary river guide, Don Gubler, who once successfully piloted his canoe under a bridge backwards while doing a headstand (Miri promises not to do this). This is Miri’s fifth summer on the river, but her third season with Dave Hansen. The first two summers she spent guiding boy scouts down the Snake in canoes. She took a 2-year hiatus from Jackson so she could go be a marine biology guide on Hatteras Island, North Carolina where she got to run kayaking tours in the sound, collect shells, and catch crabs with kids. Miri originally hales from Salt Lake City, Utah and has a degree in Parks and Recreation with a focus on sustainable tourism. When not on the river, Miri loves to write, color, hike and take incriminating pictures of her cat Bear. She collects cool card decks, tells great dad jokes and can probably eat more cheese than you. Miri loves EVERYONE so please feel free to say hi whenever you see her (if she hasn’t already, which is unlikely). Miri cannot wait to show you an amazing time this summer! Sandy is from Hanover, NH and first became passionate about rafting after two trips down the Grand Canyon and a trip down the Zambezi in Zambia. He now joins Dave Hansen for his third season of guiding! Sandy studied environmental policy at Colorado College in Colorado Springs and, before moving to Jackson, lived in Africa where he played soccer and worked for Grassroot Soccer. When he’s not on the river, you can find Sandy playing soccer, hiking, snowboarding, and eating at Calico Restaurant. Sandy encourages his guests to study up on their sports because he’ll have some sports trivia coming their way! Wade is a villainous raft guide, so be prepared to expect the unexpected when rafting with this one. He has several sneaky qualities that make him knowledgeable on the Snake River, and we are overall glad to have him as part of our Dave Hansen team. Erick hails from outside of Boston, MA, but hightailed it out west as soon as he could. This is his second year guiding on the Snake and first with Dave Hansen, and with certifications in Swiftwater Rescue and CPR/First Aid, he’s ready for action. Erick studied art at Colorado College, and in addition to pushing rubber down the river is also a practicing printmaker. When he’s not on the river you can find him mountain biking, playing disc golf, snowboarding, or enjoying a killer meal at the Rendezvous Bistro. All you need on the river is an open mind and a good attitude! Let’s go boating! This is Jordan’s first summer with Dave Hansen. He is a Whitewater Nomad and has been guiding for 20+ years on rivers all over the world. He is currently attending Missoula College studying pre-nursing. 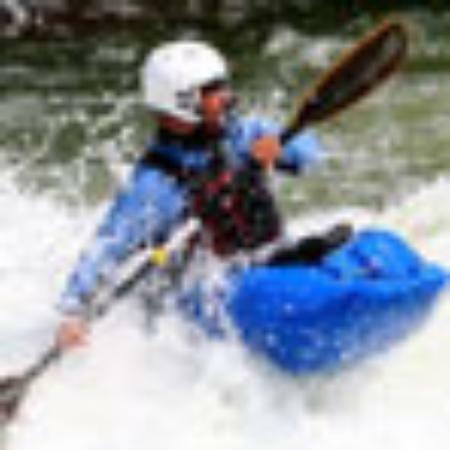 Jordan has guided in West Virginia on the New and Gauley River, which is a Class V river. He has guided in Idaho on the Payette Rivers. He also has experience guiding in several other countries such as in Peru on the Rio Apurimac (class V, headwaters of Amazon) and Rio Chili, Argentina on the Rio Mendoza, in Chile on the Rio Trancura, where he guided in Spanish (class V) and Rio Maipo, and in Zambia on the Zambezi River (class V and considered one of world’s most difficult rivers). This is Karen’s first year with Dave Hansen! Although it’s her first year raft guiding with DH, she has guided overnight kayak camping trips in Yellowstone and Grand Teton National Park for 3 summers. She is certified in first aid, CPR, WFR and swiftwater. Karen is originally from Eastchester, NY and studied chemistry at UVM. She moved to Jackson 5 years ago. She visited Jackson for the first time when she was 5 years old, loved it so much and promised herself she’d live here one day. When she’s not on the river you can find her skiing, hiking, swimming, kayaking and snuggling her cat, Mr. Meowgi. Her favorite dish is a spicy curry from Thai Plate! Karen wants to encourage her rafters to ask all about Jackson Hole, from geology to human history! Travis is from Amherst, MA “where only the H is silent. He studied hospitality and tourism management at the University of Massachusetts. This is his 1st year at Dave Hansen, but his 9th year guiding rivers. During the off-season Travis likes to take long moonlit walks on the beach and surf righteous waves. His favorite place to eat in Jackson is the Lift restaurant and his favorite thing to do is go whitewater rafting, obviously. When Travis isn’t working on the river you can generally find him on the river going boating. His tips for new customers are to have fun and help me help you. Gail is a strong, skilled, intuitive, and brave river guide. She is not a woman who backs down easily. When she senses danger, she will do whatever it takes to keep her rafters safe. No matter the cost! She has been guiding on the Snake River for many years now, and nothing can stop her when she has a goal in mind. Having been one of the only three people to successfully raft the Gauntlet, she is one of our most experienced guides at Dave Hansen! Roger is from Greenfield, MA, and has been a raft guide for 9 years, even though this is his first summer with Dave Hansen. He studied outdoor education at Green Mountain College/UMass. Roger has his Swiftwater, CPR, and First Aid certifications. Roger started rafting on the Deerfield River in MA, and was the “best of the best” raft guide on the river. He also is also an olympic level sleeper. Roger likes ice hockey, whitewater kayaking, skiing, photography, and eating anything wicked spicy. His favorite things to do in Jackson are boating and camping with friends, and his favorite place to grab food is Hoback Market. When Roger isn’t working he’s getting super pitted at Lunch Counter, Teton Country Library, or Jackson Whole Grocer. Ben returns to Dave Hansen for his second year. After driving shuttle for Dave Hansen last year, he decided it was time to hang up the keys and find out what guide life was all about. Ben is from Toledo, Ohio and studied business management at the University of Cincinnati. In Ben’s spare time he likes to climb and hike in GTNP, float Deadman’s to Moose, camp, and drink John Daly’s. In the off season he likes to visit home, go to wing night at the Bird, and purchase un-necessary gear for the upcoming season. Ben has his Swiftwater, CPR, and FIrst Aid certifications, and if you’re on his raft he’ll have you count bald eagles, get the kiddos on the oars, and encourage you not to be afraid to get wet! Lily joins Dave Hansen for her seventh season! With six years of guiding experience and certification in First Aid, Wildlife First Aid, and CPR, Lily is a pro. An east coast transplant, Lily grew up in Brunswick, Maine. In college she studied health science and public health at Northwestern University. She went on to get her masters of education in science from Western Governors. When Lily isn’t on the river, you can find her mountain biking, gardening, cooking, running, enjoying local music in town, eating at King Sushi, or spending time with her german shepherd, Ranger. Additionally she loves hiking to Table Mountain and Delta Lake. During the school year she teaches at Jackson Hole Middle School. If you want to see wildlife, you’re in luck. Lily is one of very few guides that have seen both mountain lions and bears on her tours. Lily encourages her rafters to ride the bull, trust their guides, and of course, WEAR SUNSCREEN!! Bud is the owner of Dave Hansen Whitewater. Born and raised in the Bay Area of California, he owes his love for rivers to his father, cousin, and uncle. A spoiled child, Bud was lucky enough to spend his high school summers guiding fishing trips on the Truckee River, and his college summers out here guiding in Jackson Hole for Snake River Park. Let us just say, Bud has never strayed far from rivers. After 15 years on the Snake River, he still yells out river commands in his sleep. Bud and his amazingly fabulous wife Kelly, were lucky to spend a year working with Dave before taking the plunge and buying the company in 2003. Bud and Kelly feel eternal gratitude for Dave, and their goal is to keep Dave Hansen Whitewater thriving for yet another four decades. Oh, and if it’s not too greedy, they’d love for their two girls be on the oars by the age of 15. Yes, child labor is illegal, but I think there are ways around it when they’re your child. Jess, Tori, George and Roger. Could not have asked for a better group to take us on out trip. Very good service and guide. Great stories and entertaining individuals.